There was a day, back in November of 2001, when a dedicated, intense, aquarist, now flirting with middle age, gazed intently into a larvae tank with mounting excitement. The almost infinitesimal larval fish that had been the focus of his existence for so many months now looked a little different on day 5. Not so different that anyone else looking into the tank might notice, no, you had to have watched these particular larvae develop from tiny eggs time and time again. You had to have watched them hatch as little blobs of protoplasm with a tail, and then gain fins, internal organs and eyes over a period of 4 days, and then on day 5 begin to hunt for food, and not finding it, slowly use up the remains of a yolk sac, begin to shrivel, begin to drift, lose energy and finally by day 9, lose the battle for existence. This occurred time after time after time. And this was just another trial long after any sensible, some might say sane, aquarist would have chalked up another failure and moved on to something that seemed to have a chance of success. But Frank was not just any aquarist. He had a vision, and the drive to accomplish something that many said was impossible, something that had never been done before, and something with great economic potential. This was the successful rearing of a larval fish from the incredibly tiny egg of a pigmy angelfish, Centropyge sp., the Holy Grail of marine fish culture. Now on day 5 the tiny larvae had rounded abdomens, showed signs of actual growth, and had indications of energy that he had not seen before. The untrained eye would see nothing unusual, but Frank knew that this was different. Could it be that the newly acquired first food organism really be the missing link to successful culture? And so it was. Each day the larvae gained in size and color. By day 7 Frank was probably desperately trying not be wildly optimistic. Growth and development was definitely occurring and by day 9 it was obvious that the mysterious first food organism had been found. Frank Baensch is the aquarist that made this remarkable breakthrough. It defines the basic techniques for the culture of marine fish that reproduce with very small eggs in the 500 to 800 micron range. This is a process long sought by professional and amateur marine fish culturists since at least the 1970s. One might think that Frank was working at a large government or university institution, or perhaps in the bowels of some super secret corporate laboratory. But as with many basic advances in the science and technology of marine organism culture, this was not the case. This breakthrough occurred in Frank’s 700 square foot garage/hatchery facility in Oahu, Hawaii, an extent of aquaristic space not uncommon among dedicated home based aquarists. Of course, Frank is not an ordinary aquarist, he has experience and expertise honed by many years of research on marine organisms, and he lives in Hawaii, in the middle of the Pacific Ocean for gosh sakes, with the natural environment of these fish on his very doorstep. But through Frank’s work, it may someday be possible to rear these and other difficult to rear species in places like Atlanta, or even Chicago, and, I sincerely hope, the Florida Keys. Frank very graciously shared his work with us in two remarkably open and honest articles published in Freshwater and Marine Aquarium Magazine (FAMA), Baensch (2002) and Baensch (2003). In these articles Frank describes his work with rearing Fisher’s angel ( C. fisheri ), the lemonpeel angel ( C. flavissima ), the flame angel ( C. loricula ), and most recently the multicolor angel ( C. multicolor ), and the Japanese pygmy angel ( C. interruptus ). There have been two other recent breakthroughs with small-egged marine fish. Karen Brittain at the Waikiki Aquarium reared one individual of the Hawaiian masked angel, Genicanthuspersonatus, and at the Oceanic Institute, Charles Laidley, Andrew Burnell and Anthony Ostrowski, report spawning and rearing the flame angel ( C. loricula( and spawning the yellow tang, ( Zebrasoma flavescens ) described by Clyde Tamaru. This all happened in Hawaii, the results of work independently conducted, with little or no communication between the researchers. Obviously there is something in the water in Hawaii. A pompano egg at the instant of hatch. The Atlantic pompano, Trachinotus carolinus, is a very valuable sub tropical marine food fish. The eggs are about 1 mm, fairly large for a marine pelagic egg, and as do most tropical marine fish eggs, hatches in about 24 hours. Here the undeveloped pro larva breaks free from the chorian, the egg “shell” and the early pro larva completes its development as a planktonic organism. A larval pompano about 3 days after feed has begun. All organ systems are now fully developed and functional and this larvae has a gut full of rotifers. The greenish digestive gland at the end of the gut is expanded and adsorbing the nutrients from the digested rotifers. 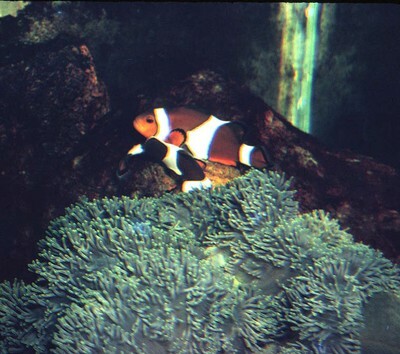 Spawning clownfish in small home aquariums is commonplace now, but in it was rarity in 1972. This the second spawn of our first pair of common clownfish. The female is laying down a row of eggs and the male follows her and fertilizes the eggs. In this case, as in nature, spawning takes place within the sphere of protection offered by an anemone. 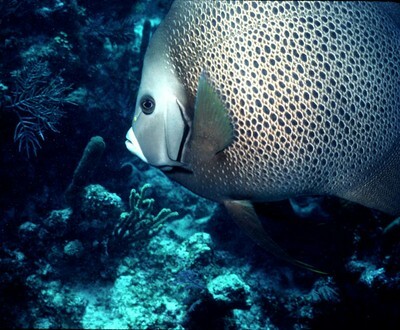 A gray angelfish, Pomacanthus arcuatus, on the reefs of the Florida Keys. We captured our brood stock of this species by SCUBA diving, chasing the pairs with drop nets and carefully capturing reproductively active pairs. We would hold them in the spawning room at the hatchery for a day or two and then manually spawn them when the eggs were ready. After spawning, the adults were released back on the reefs. Rock beauty angelfish, Holacanthus tricolor, eggs and pro larvae at the time of hatch. 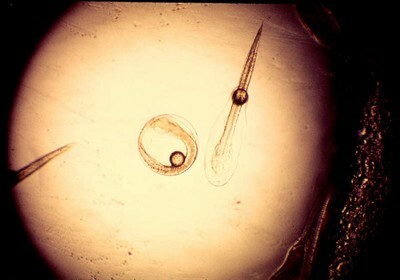 The rock beauty angel eggs, 0.7 mm, are a smaller than pompano eggs, 1 mm, and gray angel eggs, 0.9 mm and the newly feeding larvae are a bit smaller than the gray larva. The gray angelfish larvae and the rock beauty larva, however, did not feed on rotifers and had to be fed wild plankton. Only the gray angelfish larvae survived. So with this new dawning, this great breakthrough in marine fish culture, this seemed like a good time for a retrospective on ornamental marine fish culture. After all, I was there on the first morning, that first crack of dawn in the culture of marine tropical fish. Actually the sun was already peeking over the horizon of tropical marine fish culture in November of 1972 when my first pair of clownfish spawned in the 50-gallon tank in the foyer of my home in St. Petersburg, Florida. I had spent the previous three years working on the culture of pompano, a pelagic spawning, tropical marine food fish, with a private company in Rivera Beach, Florida. During that time we developed techniques for conditioning the fish for spawning through environmental control and nutrition, artificial spawning of the ripe fish, incubation of the eggs and successful rearing of that species (and others) from the egg through the juvenile stages. This included the culture and feeding of rotifers to the first larval stage, a technique then new to the culture of marine food fish, at least here in the United States. So I had plans for all those little embryonic “Nemos” that showed up in my aquarium on that November afternoon in 1972. I already had a pretty good idea of how to go about rearing them and I was spared the agony that Frank experienced in three years of rearing trial after trial that all ended the same way, in the death of every larvae. My dues had been paid in the pompano hatchery. Seven little clownfish, Amphiprionocellaris, survived the first rearing attempt and my career as an ornamental marine fish farmer began. But even then, angelfish were the jewel in the crown of marine fish culture, and we moved to the Florida Keys in 1974 to wrest this jewel from Neptune’s coffers. We were successful, after four years or so, in rearing large numbers of the large egged (900 micron egg diameter) angelfish, the Atlantic Gray and French angelfish, Pomacanthusarcuatus and paru. But our efforts with the smaller egged species (600 to 700 micron egg diameter), the queen and rock beauty angelfish, Holacanthusciliaris and H. tricolor met with failure. The cost of culture was high, however, and the best price we could get on the little angelfish back then was fifty cents, so despite all our work, it was not economically feasible to breed them at that time. I thought it would be interesting to compare and contrast the work that we did back in the late 70s on the large angelfish with Frank Baensch’s work on the pigmy angelfish, as he reports it in the FAMA articles, in the context of the seven fundamental factors of tropical marine fish culture. I have often said that breeding marine tropical fish depends on providing an adequate substitute for the biological essentials that a particular species requires for successful reproduction. No way, no how, can we duplicate the oceanic environment in a tank, but we can learn from nature and build an environment that will provide an adequate substitute for the specific requirements of the target species. With some species this is relatively easy and with others it is very difficult, but it always depends on an understanding of the biology of the species in nature, a lot of trial and error, and a little luck. Adequately satisfying these seven fundamental factors, defined for each species from clues gleaned from nature, are essential to successful breeding of marine tropical fish. These are the nuts and bolts of an aquarium system: photoperiod, temperature, salinity, substrate, background, and water movement. These basic parameters, “tank setups” if you will, are the easiest of the fundamental factors to provide. They are a consideration in both brood stock and larvae tanks. An adequate substitute for these factors as they occur in the natural environment of the adult spawning fish must be developed in the brood stock tanks. Analysis of these factors in the oceanic environment where the adults of the target species occur is not a difficult task. Frank obviously meets these requirements in his brood stock tanks as do many, many other aquarists (knowingly and unknowingly) that keep these small angelfish in their aquariums. Spawning of pigmy angels in tanks as small as 20 gallons is common and there are also some reports of spawning the smaller species in tanks as small as 5 gallons. The large angels, especially the Pomacanthus angels at 12 to 18 inches in length, are a different story. Large tanks, 1,000 to 10,000 gallons will probably be needed to provide the space and habitat stability that would provide an adequate substitute for their natural environment. And it may be difficult to provide a diet that will produce a stable reproductive condition. The cost factor in maintaining a good brood stock will not be insignificant. In our work with the large angels we depended on the offshore reefs to care and condition the brood stock. They spawned naturally (of course) on these reefs from April through October each year, mostly May and June, and we could easily capture reproductively active adults at almost any time during this period, bring them into holding tanks in the hatchery, and spawn them as the eggs matured (final hydration and ovulation) naturally or induce egg maturation with hormones. Either way we were able to produce high quality fertilized eggs from the large angels at almost any time without the expense, maintenance, and difficulties associated with captive brood stock. The larvae tanks are much different from the brood stock tanks. Instead of providing an adequate substitute for the benthic reef environment inhabited by the adults, the larvae require an adequate substitute for the pelagic, open ocean, near surface environment where the larvae feed and grow during the early days of their existence. This is where water movement, background (a uniform dark blue or black background provides the larva with a stable contrast to the food organisms, and, my theory, reduces stress), and proper adjustment of the other physical elements combine to provide the environment that allows survival. I think that these elements in both Frank’s work and the earlier large angel work are basically similar. Everyone knows that corals and anemones and other invertebrates that depend on photosynthesis require light of high intensity to survive and thrive. But this requirement for larval fish is not so well known or appreciated. The key word here is “thrive”. Larval marine fish occupy the planktonic pastures of the upper reaches of the sea, an area where the water is clear and sunlight is the most intense of any oceanic environment. The fact that marine larval fish can survive at lower light intensities does not mean that that they will thrive. I believe that most marine larval fish will grow better and faster at higher light intensities, they may not need the intensity of sunlight, but one or two fluorescent bulbs four feet over a dark larvae tank effectively puts the larvae in twilight for the entire larval period. I observed this effect in my orchid dottyback larvae tanks in the mid 90s. Increasing the light intensity directly over the tank apparently stimulated the larvae to feed more avidly and swim more quickly. Frank may also be aware of this effect, if it is indeed a factor in pigmy angel culture, and provide higher intensity lighting over the larval tanks than is normally used in such situations. I also found that larval stage growth and survival, and rapid metamorphosis, of the large angels was markedly better in large outdoor tanks, covered with a 70% shade cloth but still with light many times more intense than in indoor tanks with fluorescent lighting. Of course the water volume was much greater in the outdoor tanks and this was certainly also an important factor. Intense lighting is also helpful for brood stock of marine tropical fish species that inhabit the shallow reefs, but not particularly for those that live at greater depths. It used to be, back when I was working with the large angels, that the definition of good water quality in marine aquariums was nitrate levels below 50 ppm, a pH of at least 7.8, and the ability to see the back wall of the tank. Times have changed, thank goodness, and now there are many chemical parameters that reef tank aquarists monitor and maintain. And these are also important to the larval stages of tropical marine fish, especially normal calcium levels, near zero nitrate levels (although clownfish larvae don’t seem to mind elevated nitrate levels), low organic and nutrient levels, normal seawater pH, low bacteria levels, the adequate presence of the major, minor, and trace elements, and a factor that may, or may not, be measurable as redox potential. This last factor may be the absence of bacteria and fungus, and/or it may be defined by the “purity” of the water. This is something that Frank may or may not have encountered and may or may not have solved. It may well not be a problem in the systems and techniques that he has developed. OK, this requires a little explanation. During my work with the orchid dottybacks in the mid 90s, I also dabbled with rearing the flame angel, C. loricula, and I ran into a condition not uncommon in working with pelagic eggs from captive systems. This was the almost complete mortality of eggs during the night hours before hatching in the morning. Typically less than one percent would survive to hatch and these did not produce strong larvae. The answer to this situation was simple, and produced remarkable results. I recalled that we never had this problem when working with the eggs from the large angels back in the Keys. We did use natural seawater at that time because it was abundantly available. So I tried natural seawater for the incubation of the eggs. And there was not much difference in survival of the eggs. But there was still another difference. We always treated the raw seawater by holding it in a reservoir tank and applying swimming pool chlorine at a level of about 5 ppm for a day or two before using the water in the culture facility. This eliminated all (or most) microbic life in the water and increased the redox level of the water as well. So I treated the water with chlorine the day before the spawn and then neutralized the chlorine a few hours before the spawn with sodium thiosulphate, a process I have used for natural seawater ever since a red tide absolutely shut down production at our first hatchery on Bayboro Harbor in St. Petersburg in 1973. The chlorine treatment solved our water toxicity problem at that time and it also solved the problem with egg survival of the flame angels. The next day instead of 5 live eggs and 495 dead eggs, I had 5 dead eggs and 495 perfect, transparent clear micro spheres of developing flame angels. I was not able to succeed in rearing them past day 9, but I had neither the time nor facilities at that point to pursue the rearing process further then a few quick experiments with wild plankton and ciliates. And ciliates did not work for Frank either. As an additional note, incubation of egg masses of queen conch here in the Florida Keys always resulted in death of the egg mass until the incoming water was treated with ozone. After that water treatment the eggs develop normally and the larval conch survive. Also, in our work with rearing the larvae of the large angelfish back in 1977 we hit a impasse that we could not surmount for several years. 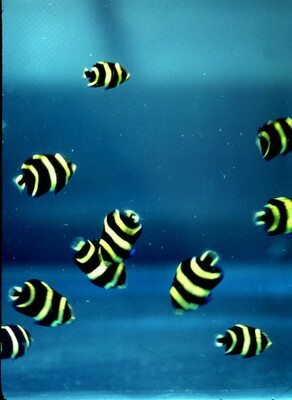 The angelfish larvae in our rearing tanks just would not survive in large numbers. We would typically grow past metamorphosis only a few dozen fish out of thousands of eggs. This continued despite all our efforts at analysis and treatment. Finally, after experiments with many treatments, application of a single antibiotic, streptomycin, a treatment that should have had no effect whatsoever, changed everything. Hundreds of little angelfish survived in tanks where only a very few made it through metamorphosis only weeks before. I am convinced that the changes in water quality that are produced by a water purification treatment are essential, or at least very helpful, to survival of many egg and larval forms in captive systems. I also think that there are other ways of achieving the proper water quality without use of antibiotics and I would certainly discourage wide scale use of antibiotics in marine tropical fish culture. Predators in the larvae tanks are not uncommon. These can be growths of hydroids that coat the bottom and capture food organisms as well the unwary larva that brushs up against the stinging polyps. And when feeding wild plankton, arrow worms (chaetognaths) that sneak into the tank can quickly decimate a population of larval fish. Also the tiny medusa that accompany the plankton, with their pretty translucent bells and dangling poisonous tentacles, will sting and kill fish larvae. Inherent in feeding wild plankton are the dangers of parasitic protozoans such as Cryptocaryon and Amyloodinium, which can destroy a tank of late-stage fish larvae. Treatment with copper is possible, but very dicey in the larval stage. If it doesn’t kill the fish larvae, it will destroy the food base in the tank. Less common and more manageable in wild plankton feeding regimens is the occasional fish egg from a piscivorous species, such as sea trout, stargazers, and dolphin that slips into the tank. Many precious larvae can be lost if the piscivorous larva grows large and fast enough to prey on other fish larvae and/or post larvae. Close observation and specific removal of the offending fish eating larvae is the only offence against such an invader. These problems are not a concern in a monoculture of one fish species fed on hatchery cultured organisms, but do I recall that when I was rearing spotted sea trout, Cynoscion nebulosus, it was not an uncommon occurrence to see a large post larva with the tail of an only slightly smaller late larval sea trout extending out of its mouth. Finding an acceptable first food organism, one that is the right size, that stimulates the larval fish to begin feeding, that provides the required nutrition for growth and development, and of critical importance, that can be provided in the proper quantity, has been the major roadblock in tropical marine fish culture. The other problems can eventually be discovered, and fixed with technology and innovation, but if you don’t know what that first food organism is, where it is, how to get it or how to grow it, then you’re pretty much up the proverbial creek without the proverbial paddle. Brachionus sp. rotifers are not a “natural” food organism for marine larval fish. Sure, there are rotifers in the oceanic plankton, but not many. Most rotifers are fresh water or brackish water organisms, and most marine rotifers are associated with the sediments rather than the plankton. 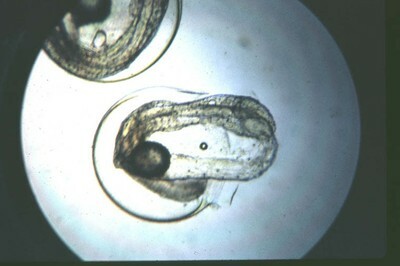 Those that are planktonic, however, are readily eaten by many fish larvae. Even though rotifers are not a major food item of marine fish larvae in nature, their small size, half the size of brine shrimp nauplii and smaller, and their rapid rate of reproduction, makes them ideal as a first food for many tropical marine fish. I have used rotifers as a first food for larval fish since 1969. But not for angelfish, oh no, not angelfish. In my experience not even the relatively large larvae produced by the relatively large eggs of the Pomacanthus angels will take a rotifer. 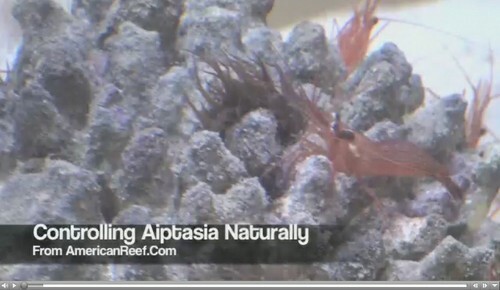 About the only thing a newly ready to feed larval angelfish will eat is the nauplius stage of marine copepods. We could only raise the larvae of our large angels on wild plankton, which was almost all copepods in various stages of development. There may be an organism that is an adequate substitute for copepods in the diet of larval angelfish out there somewhere, but I haven’t seen it yet. However in the light of Frank’s success with rearing flame and other pigmy angels on a first food of eggs and nauplii of copepods (a much more intuitive and reasonable assumption for a first food organism), it seems highly unlikely that diatoms play any significant role in pigmy angel larval nutrition. The bright spot, however fuzzy, is that diatoms and copepod eggs are mere particles; they don’t swim (in fact centric diatoms sink and don’t stay in the water column of the larvae tank very long at all). They are basically an inert particle. So if a first feeding flame angel will take an inert particle, then someday it may be possible to create a particle of the right size, buoyancy, and nutritional structure to begin the feeding process of larval pigmy angels. However, don’t quit your day job while you’re waiting for this to happen. 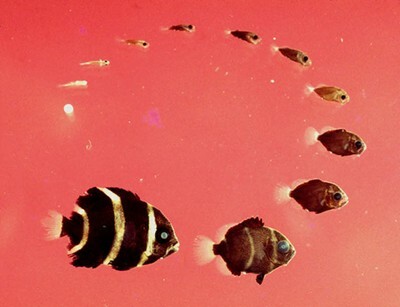 The circle of development for the gray angelfish. The egg at the beginning of the circle is about 1 mm and the post larva is about 12 mm long. The time frame for the development pictured here is about 35 days to 40 days. Juvenile gray/ French angelfish hybrids. French angels, P. paru, are more desired in the marine tropical fish market than the gray angels, but reproductively active French females were more difficult to find than gray females. We would often fertilize the eggs of gray females with French males to produce a unique fish. Some of the juveniles would favor the gray species and some the French and others seemed to display more of a blend of the characteristics of the two species. 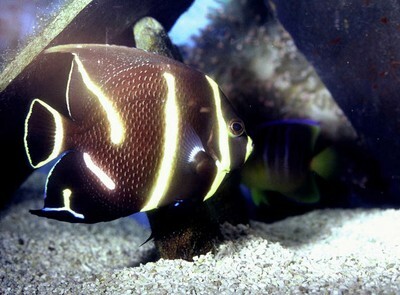 An unusual hybrid angelfish. This was the most unique hybrid between the French and gray angelfish that we produced. The unusual markings may have been a result of genetics or may have been the result of less than optimum environmental factors during larval development. A plankton tow. To survive and grow, orchid dottyback larvae required the copepods that compose most of the organisms in wild plankton. I took two or three 15 to 20 minute tows about three time a week with a 53 micron, half meter net to supply this demand. The tows were taken from a seawall at the foot of a bridge near the inlet at Ft. Lauderdale. The pole was used to hold the net away from the seawall and into the tidal current. 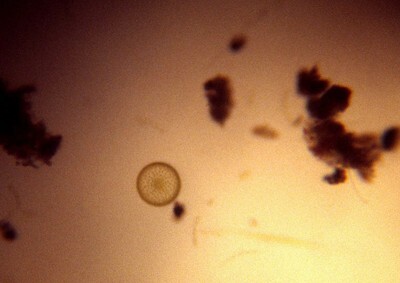 A centric diatom in the wild plankton. Flame angel larvae were very small when they began feeding on wild plankton. The only organisms I found in the gut contents were centric diatoms that were about 10 microns in diameter. This species has not been identified. An orchid dottyback late larvae tank. 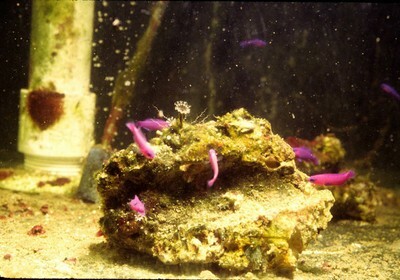 As the orchid dottybacks metamorphosed into juveniles, the larval tank was gradually transformed from a pelagic environment into a benthic environment. Here a small piece of live rock provides shelter and perhaps some food organisms to the new juveniles. Biological filtration to the small larvae tank, 8 gallons, is also provided by the well-established live rock. Once an acceptable first food organism has been found for a particular species, then one can develop a larval feeding regimen for that species. 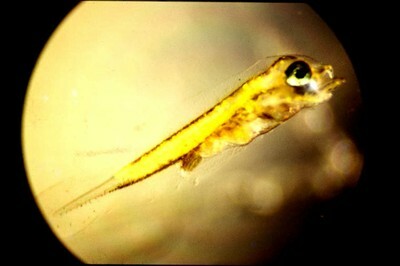 The first food organism typically will take the larval fish through the first five to eight days after feeding begins. They can usually take a larger food organism within three to four days. But after 6 to 8 days, if there aren’t any larger organisms present, they’re in big trouble. The next organism after rotifers, or copepods, is usually brine shrimp nauplii. However, the requirements of most marine fish larvae are not completely fulfilled by the nutritional profile of brine shrimp. This is resolved by enriching the brine shrimp with highly unsaturated fatty acids (HUFA) and by supplementing the diet with other foods as soon as possible. Each species, or group of related species, has a its own nutritional requirements at this early stage and dietary adjustments must be made to obtain good survival. For example, clownfish seem to have little problem moving through rotifers and brine shrimp onto a dry or a wet mix dead food, as long as they are not overfed with brine shrimp nauplii. But the orchid dottyback larvae did not survive the succession to brine shrimp after rotifers unless some wild copepods were included in the last 10 days of larval development. And with the large angelfish, wild plankton, i.e. copepods, was required throughout the larval period. Some brine shrimp could be fed but not exclusively. Frank has reported that he uses wild plankton throughout the larval stage of the pigmy angels and this certainly seems to be the best nutritional regimen for most marine tropical fish. So both the large Pomacanthus angelfish and the pigmy angels seem to require various stages of copepods throughout the larval period. I suspect that the pigmy angels require a greater abundance of the smallest copepod nauplii for a longer period than the larvae of the larger angels and this may be why we had no success rearing queen and rock beauty angels. When breeding invertebrates, a great deal of attention is spent on the transition at the time of metamorphosis from the larval to the juvenile stage. Often there is a specific requirement for a cue from the environment that signals the late stage larva that it is “OK” to leave the plankton behind and settle comfortably into benthic life. This may be a pheromone from older individuals of the same species, a chemical released from a species of algae or sessile invertebrate, or maybe just a substrate that “feels right” to the first tentative inquiries of the metamorphic larvae. In the culture of tropical marine fish, however, this has seldom been a concern. The little fish go through the larval stage in a bare tank and the metamorphosis into juveniles takes place with little ceremony in the same tank. Frank’s work with the pigmy angelfish indicates that more attention should be paid to this all- important time in the life of a young fish. He describes a very long period of metamorphosis, up to 35 days, for some of the pigmy angels. I did not encounter such prolonged metamorphosis with the gray or French angels. First metamorphosis, indicated by the appearance of dark coloration and yellow bars, occurred at day 20 to 22 for many individuals, the larger ones. The smaller individuals did not reach this stage until day 30 or so. Soon after attaining the juvenile color pattern, the new juveniles dropped out of the plankton and took up residence in the corners and bottoms of the tanks. The clownfish followed the same pattern, but with a shorter larval period. With the orchid dottybacks under a good larval nutritional regimen, metamorphosis would begin for the larger individuals at about day 20. This species had a period of metamorphosis that extended for 3 or 4 days. The transparent late larvae begin to pick up a rusty hue and seek out a sheltered area at the bottom of the tank. At this point I would usually put a small piece of live rock or a pvc shelter of some type into the tank to provide enough substrate for all the larvae as they reached the point of metamorphosis. In effect, I gradually changed the ecology of the tank from an adequate substitute for the pelagic environment to an adequate substitute for the benthic environment. It may be that the presence of the live rock acted as a stimulus the orchid dottybacks to complete metamorphosis more quickly. It is very reasonable to expect that the larvae of marine tropical fish, especially fish that occupy very specific habitats, would have some natural mechanism that stimulates or enhances the change from the larval to the juvenile stage when they do find the habitat where they can best survive. Perhaps those species with very restricted adult habitat requirements have stronger post larval settlement cues than those species with broad juvenile ranges. I will certainly pay much more attention to this transition period when my fish rearing work begins once again. Frank Baensch’s work with the pigmy angels is very exciting, as is that of the Oceanic Institute and the Waikiki Aquarium. A new door has been opened, a new possibility confirmed, and we are anxious for the door to open wide. Frank has graciously greased the hinges of this new door with his articles in FAMA and it will be very interesting to watch the developments in marine fish culture over the next few years. Now if you will excuse me, I have to go down and dust off my plankton net. Baensch, F. 2002. The Culture and Larval Development of Three Pygmy Angelfish Species. Freshwater and Marine Aquarium Magazine. Vol. 25. No. 12: pp 4 – 12 . Baensch, F. 2003. Marine Copepods and the Culture of Two New Pygmy Angelfish Species. Freshwater and Marine Aquarium Magazine. Vol. 26. No. 7: pp 156 – 162.